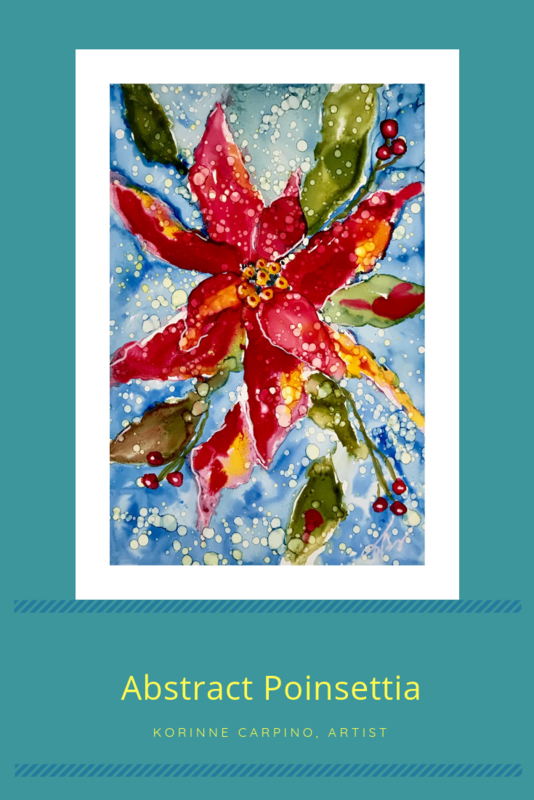 It seems I find myself creating lots of alcohol ink art paintings of poinsettias at this time of year to send as holiday greetings to friends and family. As I sit here writing this blog, I gaze out the window at poinsettias both in my front yard and the neighbors. Always curious, I start to wonder, what is the symbolism of the poinsettia at Christmas time? These festive flowers are native to Central America. According to history, the Aztecs used the bracts (the red leaves we call flowers) to make purple dye for clothing and cosmetics. The milky white sap was made into medicine to treat fevers. Today, we call the sap latex. Joel Roberts Poinsett, for whom the plant name is derived, was the first US Ambassador to Mexico in 1825. He brought the plant back to the US to grow and give to friends. The flowers were first sold as cut flowers until the early 1900s when whole plants began to be sold. There are over 100 cultivated varieties of poinsettia. There are single and double poinsettias in colors including red, white, pink, variegated, candy cane and more. The shape of the plant’s flower and leaves resemble the Star of Bethlehem which led the Magi to the Christ child. The red color reminds Christians of Christ’s blood shed for their salvation. White leaves on some poinsettias are a reminder of Christ’s purity, while the green leaves symbolize life and hope. There was once a poor Mexican girl called Pepita who had no present to give the baby Jesus at the Christmas Eve Services. As Pepita walked to the chapel, sadly, her cousin Pedro tried to cheer her up. Pepita didn’t know what she could give, so she picked a small handful of weeds from the roadside and made them into a small bouquet. She felt embarrassed because she could only give this small present to Jesus. As she walked through the chapel to the altar, she remembered what Pedro had said. She began to feel better, knelt down and put the bouquet at the bottom of the nativity scene. Suddenly, the bouquet of weeds burst into bright red flowers, and everyone who saw them was sure they had seen a miracle. From that day on, the bright red flowers were known as the ‘Flores de Noche Buena’, or ‘Flowers of the Holy Night’. Among other things, this story reminds me that a gift from the heart is the most precious gift of all. And, here is my gift to you! Click here for my video tutorial of painting an abstract poinsettia. I hope you enjoy painting this poinsettia, taking your own spin on colors and leaf shapes and creating something magical that is uniquely you. Happy Holidays to You and Your Family! May they be joyful! Awed!!! I love to paint as an 84 year old amateur. I buy supplied on Amazon, and paint rocks about the size of fists, with faces that the nature of the rock suggests. I am a friend of Frank. You are great and he has passed along some of your works.